Michael Cohen and Trump have this in common: they both should have chosen their legal representation more carefully. We all know why Trump picking Cohen was a bad idea. But not many know just how sketchy Michael Cohen’s lawyer is. His Clinton Connections are not even close to the worst of them. Naturally, the Clintons are themselves connected to the same ‘worst of them’, but let’s not get ahead of ourselves. Lanny Davis has been everywhere lately using the national platform given by the Media (D) to drop hints about what Michael Cohen might know about so-called ‘Russain collusion’ with the Trump campaign team. Of course, he can’t say anything definitively because of attorney-client privilege, but he’s out there spinning the story to make his client look good. That is his job, after all. Yes, that is indeed his job. To defend his clients and make them look good. He did that for President Clinton when he was appointed as special counsel to his old Yale pal, Bill. He was known as the ‘media snake charmer’ and navigated the Clintons through multiple scandals (eg. selling access to the Lincoln bedroom for campaign contributions,) in the pre-Monica era. He came to then-First Lady Hillary’s defense when William Safire called her a ‘congenital liar’ in the New York Times when discussing the Whitewater scandal. Since becoming Clinton’s media snake charmer in late 1996, Davis has been an irrepressible public gabber. He has been working the news media on behalf of clients for years, while also appearing incessantly on cable news and radio as a reliable liberal talking head, popping off about just about everything. A Washington regulatory attorney and Montgomery County political operative until the Clinton gig raised his profile, he dropped much of his conventional law practice and reinvented himself as a consigliere to people and companies in “crisis,” meaning anyone taking a whupping in the media. It looks like he’s pretty tight with the Clintons, wouldn’t you say? Davis has worked for Equatorial Guinea dictator Teodoro Obiang Nguema, the leader of the African nation since 1979. He wrote a speech for Obiang about human rights monitors that would be praised by Archbishop Desmond Tutu. Look at his strong commitment to the democratic process! Hold on to your hats, there’s still more. 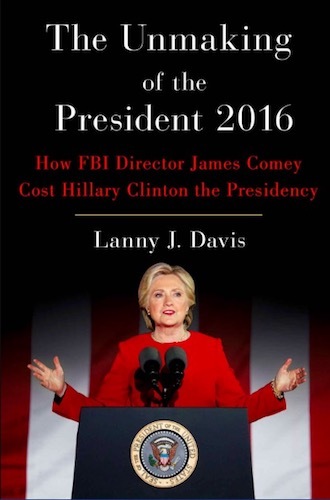 Lanny Davis isn’t just comfortable representing and cleaning up the media mess for the Clintons, African dictators, and a lawyer that recorded his private meetings with his client that was running to become president of the United States, he’s also a registered foreign agent working for a Pro-Russian Oligarch with ties to Vladimir Putin. In an article in Forbes on February 18, 2017, titled, ‘No One Mentions That The Russian Trail Leads To Democratic Lobbyists,’ Paul Roderick Gregory untangles the mess and look who’s there — none other than Lanny Davis! In the same article, Gregory mentions that there is little Media (D) scrutiny on the John and Tony Podesta’s connections to Sberbank, Uranium One, the Clinton Foundation, the Hillary-led State Department, and of course those Putin-connected players, Viktor Yanukovich and Dmitry Firtash. If Tony Podesta’s name sounds familiar, that’s because Special Counsel Robert Mueller recently granted him immunity in order to have him testify against Paul Manafort. It seems that the ‘Russian Collusion’ investigation is going on swimmingly with that move. The media targeted former Trump campaign manager, Paul Manafort, for consulting for deposed Ukrainian president’s (Yanukovich’s) Party of the Regions. He also worked for billionaire oligarch, [Dmitry] Firtash, who stands accused of skimming billions in the Ukraine gas trade in league with Russian oligarchs. The media also singled out Trump’s former national security advisor, General Michael Flynn, for attending a dinner with Putin and appearing on Russia’s foreign propaganda network RT. Trump’s own Russian ties were the subject of intense media coverage of an unverified opposition-research report purportedly prepared by an ex-British spy, who remains in hiding. It seems no enterprising reporter has tried to find him. Why is it such a big deal that Lanny Davis works for Firtash? It’s because Firtash is fighting extradition to the United States where he is wanted for bribery over a business deal in India. He’s also wanted in Spain for money laundering. Firtash currently lives in Austria and extradition orders have been issued by both the United States and Spain through the EU. Firtash is a businessman that went from rags to riches with the aid of Kremlin resources to build his gas company which now provides gas to the Ukraine. In a 2014 profile by Reuters, Firtash is described as a representative of Russian interests in the Ukraine. The Kremlin assisted Firtash in building his business, including a line of credit to the tune of $11 billion. But that’s not all. Dmitry Firtash had connections to a European crime boss, Semion Mogilevich, who is wanted by the FBI for an alleged multi-million-dollar fraud in the 1990s. In 2009, Mogilevich was placed on the FBI’s Ten Most Wanted list, but was removed from the list in 2015. The article includes the nuances of the deep connections that Firtash has with the Kremlin. Firtash is still fighting extradition orders. Sharyl Attkisson was the first to confirm that Lanny Davis is still registered as a Foreign Agent for Dmitry Firtash. She also explains what exactly a ‘Foreign Agent’ does. Former Clinton counsel Lanny Davis, who recently made headlines representing former Trump counsel Michael Cohen, represents Ukrainian billionaire Dmitry Firtash. Davis told me he’s defending Firtash against prosecutorial abuse by the Justice Department, which indicted Firtash in 2014 for alleged bribery; Firtash has paid Davis $735,000 over three years. Davis says he follows the letter of the law. Since Attkisson posted her article, others have been digging and she’s absolutely right. Just to make things a bit more interesting, it should be noted that Dmitry Firtash was added to the global anti-corruption Magnitsky List in 2017. That is the same Manitsky Act that Russian lawyer with connections to Fusion GPS, Natalia Veselnitskaya, was discussing with Don Jr. when he thought the Trump Tower meeting was to get opposition research on Hillary. Dmitry Firtash, a Ukrainian oligarch indicted by a U.S. court in 2013 on bribery and other charges, is on the list. He denies wrongdoing and is fighting extradition from Austria. This is the guy that Lanny Davis represents. Where’s Robert Mueller when you need him?